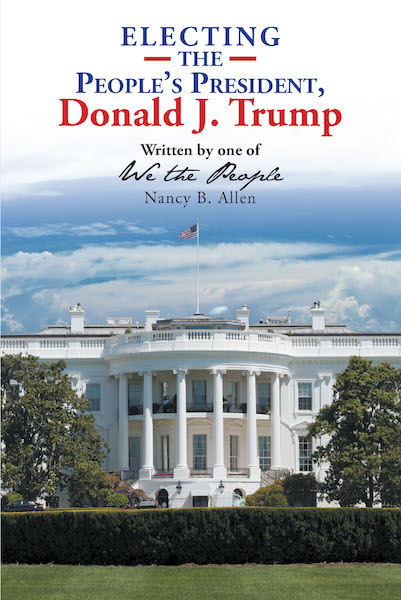 Electing the People’s President, Donald J. Trump: Written by one of "We the People"
Electing the People's President, Donald J. Trump, is a personal history of the 2016 Presidential Election. It is written by one of the sixty-two million people that elected our forty-fifth President. Nancy Allen began the journey in 2015 as did many other people. Millions of people across our great Country knew we were at a crossroad and the outcome of the 2016 Presidential Election would either turn America back to the values and foundation our founding fathers set forth in the Constitution and Bill of Rights or our Country would no longer be a Republic derived from the consent of the governed. For the most part, our elected leaders no longer represented “We the People”. Our only hope was Divine intervention. Nancy joined a daily prayer call in August of 2015 and later was part of a weekly, national prayer call represented by people from almost every state. The Washington insiders and the elite in our government had no idea what was happening in our Country. Electing the People's President is a testament of “We the People” and our Father God. It is truly a keepsake of the greatest “political awakening” in our Country's history. The pages are filled with historical pictures and documents of the campaign and the first year of the Trump administration. Nancy has included an explanation of the Deep State, how a caucus works and the importance of the Electoral College. Some of the documents are Congressman Nunes' first released memo from the House Permanent Select Committee, the electoral map of the election, President Trump's first State of the Union Address and his 2016 Prayer Breakfast speech. Electing the People's President is an encouragement to all “We the People” that worked and voted to bring our Country back to the people. The book is a great resource for all students and especially the home schooled. Electing the People's President was written for America's posterity as a truthful account of an election that surprised many in Washington and around the world. The Election's results were no surprise to “We the People”.